Download these cool ★ house vector shapes for free and use them in your graphic design projects. 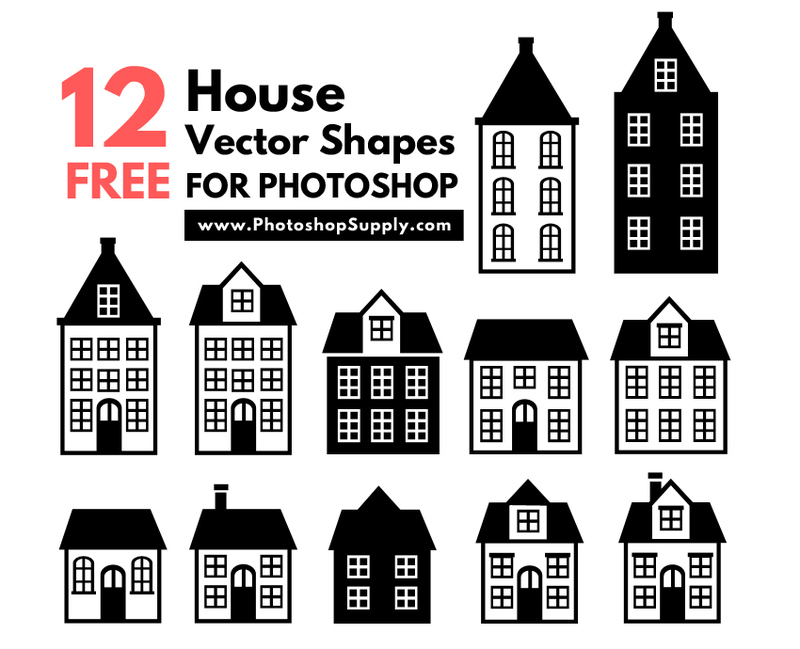 This set includes 12 houses and buildings vector shapes that you can use in Photoshop. You can convert the Photoshop custom shapes file to SVG. The shapes can be used also in Illustrator. Simply download the CSH file and you have some cool vector house shapes. You can use these Photoshop home shapes in all kind of graphic design projects like flyers, posters, website templates, etc. These house vector shapes were created in Photoshop using the Pen Tool . If you are looking for a house shape vector free, this set of custom shapes is great! In the set you will find a bonus shape, a row of houses silhouette that I hope you will find useful as well. The home Photoshop shapes are really easy to edit and customize. In Photoshop edit shape after drawing using the Convert Point Tool , the Add Anchor Point Tool , etc. In Photoshop you can edit a shape path really easy and customize it to your liking. There are lots of useful tutorials that teach you how to manipulate shapes in Photoshop. After loading the CSH file in Photoshop (Edit > Preset Manager > Custom Shapes > Load), add the shape using the Photoshop Custom Shape Tool . How to change the size of a shape in Photoshop? The free vector houses and buildings can be resized without loosing quality. How to resize a shape in Photoshop? Easy, press Control-T to modify the size of the vector shape. The Photoshop vector shapes can be used in print materials just like the vector graphics.